A tennis friend who is hell bent on improving her USTA rating recently revealed that she sees competition as an opportunity to work on her technique. That’s worth reiterating: Match play is when she works on her technical skills! Her thinking is that every time she steps onto the court she wants to improve. I understand that (though I have a more competitive mindset during match play). 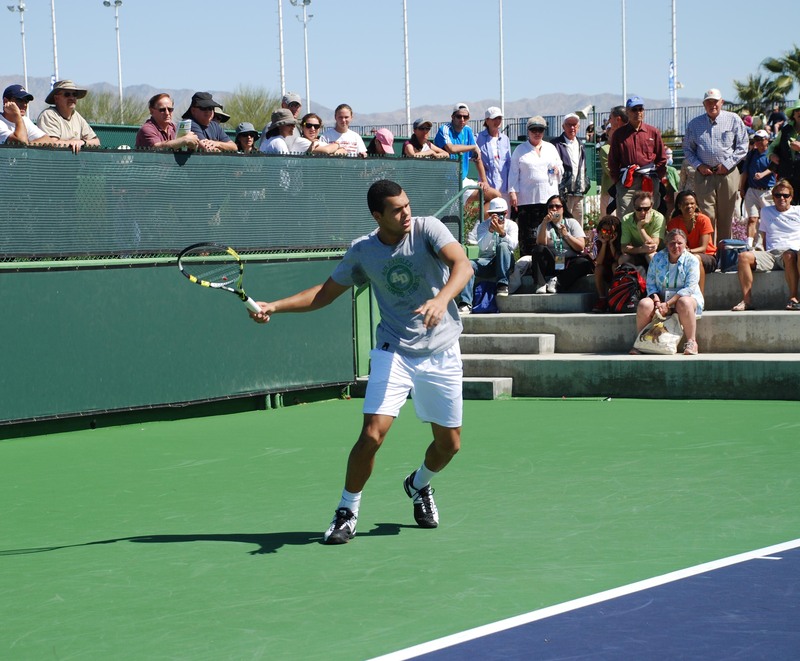 Jo-Wilfried Tsonga practicing at Indian Wells. And I wouldn’t want to be her doubles partner. That might sound harsh but a match isn’t a great time to tweak your technique. When your focus is on improving your strokes, it’s hard to concentrate on the big picture, including your strategy, the weaknesses of your opponent(s), and recalibrating your strategy or doubling down on your execution if the match isn’t going your way. There’s a lot coming at you during competition. A player’s brain has a ton of input to process in a short time. During practice, I like to slow down and put my attention on one detail, depending on what I’m trying to improve. I deliberately put on the brakes, approaching learning new habits from “beginner’s mind.” That’s an entirely different mindset from the one I take into competition. My tennis buddy mentioned that she planned to approach her next match differently – she was going to give everything she had to get the win. Although she and her partner didn’t take the match, “the point was the experience,” she reports. My friends tweaked her mindset to find what she’ll need going forward. The wins will come. What is your mindset when you compete? How is that different from when you practice? As a peak performance coach, those are some of the areas I can help you explore and address to help you improve your results. Want to take your game to the next level? for a free 30-minute breakthrough session. This entry was posted in Mental Game, Practice and tagged competition, mental game, practice. Bookmark the permalink.